Congress General Secretary Rahul Gandhi addressed a huge election rally in Mathura as part of his Congress campaign in the poll bound Uttar Pradesh. “I will not make promises. The people whose intention is noble so not make promises” said Rahul Gandhi. Congress General Secretary Rahul Gandhi said that while all other states are surging ahead the biggest state UP is lagging behind. He was addressing an election meeting in Khairagarh, Agra as part of his election campaign for the ongoing assembly elections in UP. Congress President and UPA Chairperson Sonia Gandhi http://www.blogger.com/blogger.g?blogID=1517701392959809656#editor/target=post;postID=8291997305065000675attended the convocation of National Institute of Fashion Technology (NIFT) and laid foundation stone of its new building at her Parliament constituency, Raebareli. “Five and half years back I was privileged to start the NIFT centre at Raebareli at its temporary premises and today I am delighted to have laid the foundation stone for its permanent centre and also addressing this convocation” said Sonia Gandhi. “NIFT was conceived of during Rajiv Ji’s tenure as Prime Minister and I can still recall the personal interest that he took in giving it a concrete shape. Over the past two decades the NIFT has established itself both in our country and abroad as an outstanding institution that has produced hundreds of young men and women who have brought new design and production skill to their diverse set of industries particularly in the textile area. I congratulate the entire NIFT community for its many achievements” added the Congress President. Congress General Secretary Rahul Gandhi said that BSP and SP squeezed public money like we extract juice from the sugarcane. He visited Noida campaigning for the ongoing assembly polls in Uttar Pradesh. Congress President and United Progressive Alliance (UPA) Chairperson Sonia Gandhi on Wednesday inaugurated a modern rail coach factory in her Lok Sabha constituency, Rae Bareli. Sonia Gandhi also handed over appointment letters to farmers whose land was used for the project. “This rail factory in Raebareli is another glorious step towards development and at the same time it also gives people new hope. I express my gratitude to the Railway Minister, his ministry and all staff for making this project a reality. 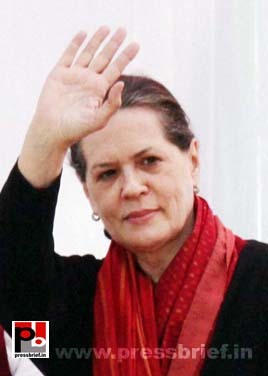 I thank you for joining us on this precious occasion and also extend warm Diwali greetings to all” said Sonia Gandhi. Congress President and United Progressive Alliance (UPA) Chairperson Sonia Gandhi on Wednesday inaugurated a modern rail coach factory in her Lok Sabha constituency, Rae Bareli. Sonia Gandhi also handed over appointment letters to farmers whose land was used for the project.”I am also hopeful that the railway ministry will take more serious efforts to ensure safety of the passengers. All the new rail coaches will have the modern bio-toilets to ensure more cleanliness and hygiene and I welcome this innovative step by the railways” said Sonia Gandhi. Congress President and United Progressive Alliance (UPA) Chairperson Sonia Gandhi on Wednesday inaugurated a modern rail coach factory in her Lok Sabha constituency, Rae Bareli. Sonia Gandhi also handed over appointment letters to farmers whose land was used for the project. “Sonia Gandhi also expressed hope that the new rail coach factory will provide job opportunities to the local residents, youth and farmers who have given their land for this project and would add to the development of the area” said Sonia Gandhi. Congress President Sonia Gandhi, following the foot steps of Indira Gandhi, is also seriously and sincerely keeping the aam aadmi as the main focus of the Congress and the Congress-led governments. Further Congress General Secretary Rahul Gandhi loves to be amongst the masses to know more about them, learn their problems and to find solutions for the grievances. Rahul Gandhi always made it clear that he got the inspiration to go to the poor from his grand mother Indira Gandhi. November 19 is the 95th birth anniversary of one the most charismatic leaders of modern India, our first and only woman prime minister, cherished by millions - the Iron Lady of India, Indira Gandhi. She is regarded by many as the country's best prime minister and her extensive agricultural and financial reforms are still relevant. Even after twenty eight years of her assassination, that has shocked the entire world, India’s only woman Prime Minister, Indira Gandhi, has an enduring presence in the minds of most Indians. For many she remains a messiah who connected directly to the poor and underprivileged with her social welfare programmes and catchy populist slogans like garibi hatao (oust poverty). She had contributed a lot for the upliftment of the downtrodden in the country. Congress President and United Progressive Alliance (UPA) Chairperson Sonia Gandhi on Wednesday inaugurated a modern rail coach factory in her Lok Sabha constituency, Rae Bareli. Sonia Gandhi also handed over appointment letters to farmers whose land was used for the project. “When the foundation stone for this factory was laid, several people were spreading rumours about its future. But, now, we could complete this project successfully within the time schedule and the coaches assembled here were flagged off too. 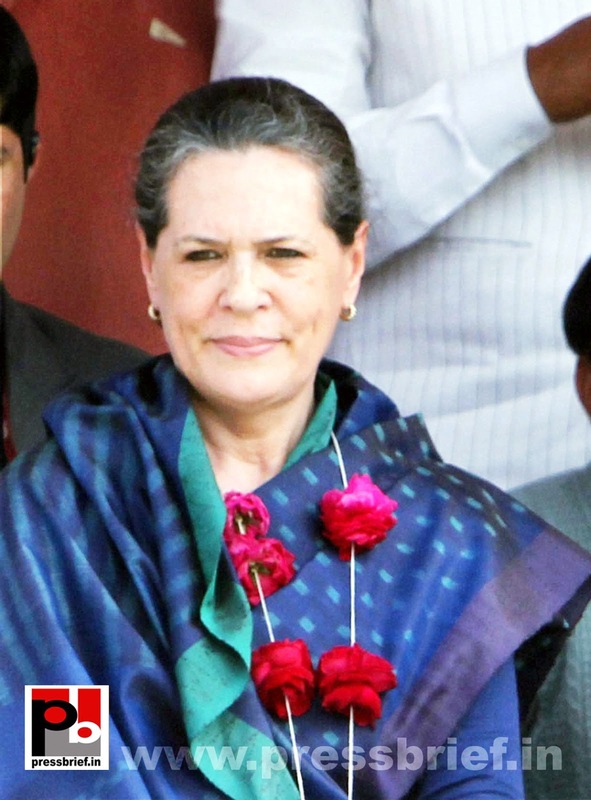 I congratulate the railway ministry and its officials for this commendable achievement” said Sonia Gandhi. Congress President and United Progressive Alliance (UPA) Chairperson Sonia Gandhi on Wednesday inaugurated a modern rail coach factory in her Lok Sabha constituency, Rae Bareli. Sonia Gandhi also handed over appointment letters to farmers whose land was used for the project. She also laid the foundation stone for the doubling of Raebareli-Utratiya rail line and a multifunctional complex. “The Rs. 2500 crore Raebareli rail coach factory is the third of its kind in India. Rs 800 crore has already been utilized. The factory will have all the modern and environment-friendly techniques to provide more convenience to the passengers” said Sonia Gandhi. Congress President and United Progressive Alliance (UPA) Chairperson Sonia Gandhi on Wednesday inaugurated a modern rail coach factory in her Lok Sabha constituency, Rae Bareli. Sonia Gandhi also handed over appointment letters to farmers whose land was used for the project. She also laid the foundation stone for the doubling of Raebareli-Utratiya rail line and a multifunctional complex in Raebareli. Congress President and UPA Chairperson Sonia Gandhi attended the convocation of National Institute of Fashion Technology (NIFT) and laid foundation stone of its new building at her Parliament constituency, Raebareli. “The opportunities for those in the fashion design business have never been better than they are today. The markets for their products, both in India and abroad, have grown enormously and new technologies have developed to enable the designers to work more innovatively with cotton silk and woolen. In the years ahead I look forward very much to seeing what you the new graduates of the NIFT create” said Sonia Gandhi. Congress President and UPA Chairperson Sonia Gandhi attended the convocation of National Institute of Fashion Technology (NIFT) and laid foundation stone of its new building at her Parliament constituency, Raebareli. “Prime Minister Indira Gandhi, who was a Member of Parliament from this constituency, had an innate sense of fashion and the simplicity of her elegance was admired all over the world” said the Congress President. “Adding more and more ornamentation to our garments is very easy but that does not add up to the fashion. To find the right colour combination, cut and proportion in a garment to ensure that it is comfortable as well is more challenging for a designer but it results in a garment that is timelessly stylish and elegant. Congress President and UPA Chairperson Sonia Gandhi launched the Smile train programme at Simhans hospital in Raebareli on Thursday. Earlier she also held meetings with several delegates and people at Bhuamau guest house and. She is also scheduled to attend the meeting of the district vigilance and monitoring committee. Congress President and UPA Chairperson Sonia Gandhi on Sunday encouraged the partymen with an aggressive speech defending her party and the UPA government at the centre. She also argued that only Congress is committed to work for the benefits of the poor and underprivileged. Slamming the opposition, Sonia Gandhi said “I want to make it clear that these parties are trying to weaken the democratic system of our country. But we will never let them to do so. Congress is a party that has always protected the nation’s constitution”. “We never allowed anyone to disrupt the democratic principle of the system and we will never ever allow such trends. The people who never find it wrong to indulge in weakening our democratic system, will never find it wrong to spread rumours about others” warned the Congress President. Taking an indirect jig at BJP Sonia Gandhi added “Those who are talking about corruption are finding themselves neck-deep in corruption. There is a saying that there are wells waiting for those who dig caves for others”. “Corruption is a cancer which affects the common man the most. But we have fought this disease before and we will continue to fight this disease with all strength once again. We will fight all graft charges against us and none found guilty will be spared. It was the Congress, which brought a strong legislation to tackle corruption – the RTI, through which any one can get information about the government” explained the Congress leader. “You just ask yourselves whether anybody can bring such an important legislation, other than Congress? Such a law can be enacted by only a government which is committed to fight graft effectively and it is only the Congress” said Sonia Gandhi. Several senior Congress leaders including General Secretary Rahul Gandhi, Prime Minister Manmohan Singh also addressed the rally at the historic Ramlila grounds. Congress President and UPA Chairperson Sonia Gandhi on Sunday encouraged the partymen with an aggressive speech defending her party and the UPA government at the centre. She also reiterated that only Congress is committed to work for the benefits of the poor and underprivileged. Launching a scathing attack on opposition, Sonia Gandhi said “Today there a lot of rumours are being spread against the party and the government. The opposition is levelling several allegations of corruption against the government. What is the truth and untruth in these allegations needs to be understood well. The voters reposed faith in the Congress in 2004 and 2009. A few parties have not been able to digest this”. Slamming the opponents for the negative stance, the Congress President added “ They have been trying to weaken the government elected by the people and they continue to halt our welfare policies by frequently obstructing the function of the parliament. Why they are doing so? Why they are opposing the policies which are meant for the poor and aam aadmi? Why they are not allowing us to discuss the crucial issues affecting the people? “But I am sure that their real face will be exposed before the public” said Sonia Gandhi. Nation remembered Pandit Jawaharlal Nehru, the first Prime Minister of India on his 123rd birth anniversary. President Pranab Mukherjee, Vice President Hamid Ansari and Congress President Sonia Gandhi paid floral tributes at Shanti Van, New Delhi. “I feel very happy to see all of you at this historic Ramlila maidan. I wholeheartedly welcome all the people who have joined us here from various parts of the country. We not only are glad to see you in large numbers but we also get encouragement and renewed energy from you” said the Congress President amidst cheers from the huge crowd. Sonia Gandhi went on to say “You know that Congress party has always been working for the upliftment of the poor, aam aadmi, farmers, workers and all other sections of the people. We not only led the freedom struggle but we also initiated the process of modernization in India. Our great leaders were an inspiration not only to us but also for the entire globe. Congress always believed in secularism, and we have been working to unite the people. No one can challenge us our commitment in this regard”. Explaining the purpose of the mega rally, the Congress president said “We called this rally to make it clear that we will successfully challenge the serious socio-economical-political situation being faced at present”. Several senior Congress leaders including General Secretary Rahul Gandhi, Prime Minister Manmohan Singh also addressed the rally at the historic Ramlila grounds. “You know that Congress party has always been working for the upliftment of the poor, aam aadmi, farmers, workers and all other sections of the people” she said. Stressing that the Congress was a party of the common man, weaker sections, poor and farmers, Sonia Gandhi said no other party in the country could compete with it on secularism. “The voters reposed faith in the Congress in 2004 and 2009. A few parties have not been able to digest this. We will once again do well in the coming polls,” she argued. Referring corruption the Congress President said “Corruption is a cancer which affects the common man the most. But we have fought this disease before and we will continue to fight this disease with all strength once again. We will fight all graft charges against us and none found guilty will be spared. It was the Congress, which brought a strong legislation to tackle corruption – the RTI, through which any one can get information about the government”. Taking a dig at BJP, Sonia Gandhi quipped “Those who are talking about corruption are finding themselves neck-deep in corruption.” She also slammed the opposition for trying to weaken the democratic system of the country. Noting that the opposition had not allowed key legislations to be passed or allowed discussion on issues in parliament, she said the Congress would not allow them to succeed in their bid. 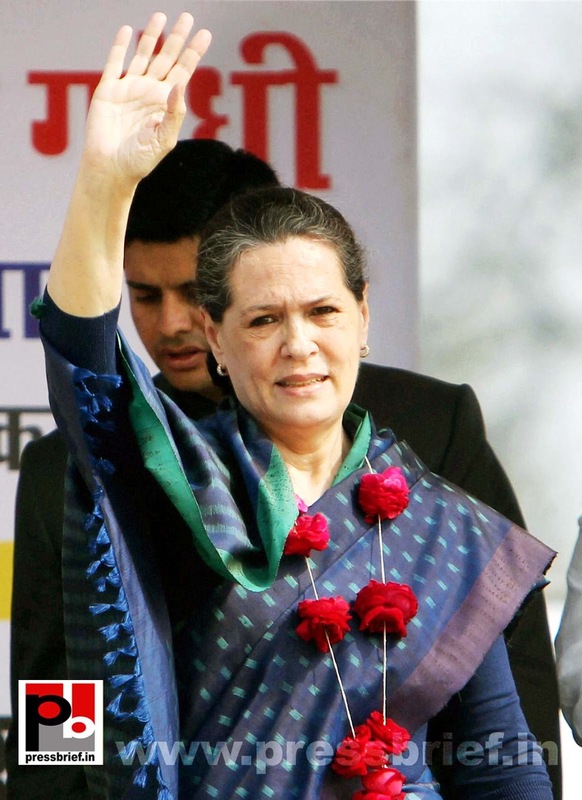 “Congress is a party that has always protected the nation’s constitution,” said Sonia Gandhi.